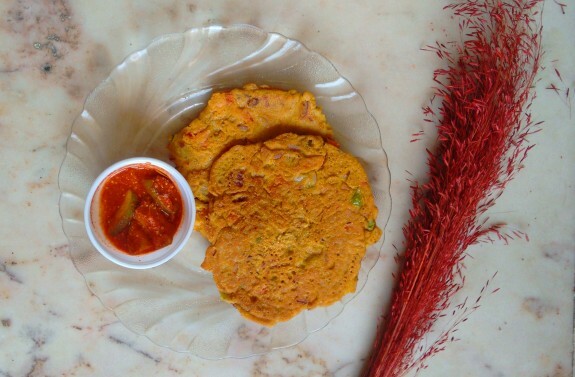 Oats Pancake is one of the best recipes of Oats. Give your Kids and Elder with the colourful Oats meal as breakfast or lunch box by using tomato, carrot or spinach to make it more tasty and healthy too. 1. First grind the masala oats to make fine dust of oats like the texture of maida. 2. Now take a large bowl and add Masala oats dust, corn flour, semolina, cumin seeds, turmeric powder, coriander powder, red chilli powder, chopped green chillies, chopped tomato, capsicum and onion and mix it well. Add little salt and water to make semi thick batter. 3. Now heat a flat pan and sprinkle little oil on the pan. Pour 2-3 Tbsp batter on it and spread it over the pan to give a round pan cake shape. 4. Let it cook for 1-2 minute. While the sides will leave from the pan, flip the other side to make it cook. 5. Your Oats meal Pancake is ready to eat. 6. Serve it hot with pickle or raita or tomato sauce. Note: You can use Plain oats instead of masala oats. In that case, you have to use the spices little more.